You might have all the right intentions when it comes to eating a healthy diet but in reality it's often quite difficult to achieve this whilst living a hectic lifestyle that's punctuated by frequent social activities, late nights and the odd drink or two. However, it is possible to stick to a predominantly healthy eating regime and still have a typical student existence on the side. You'll need to be a little more organised and careful with your food budget than your junk food-scoffing counterparts, but you'll feel the benefits and will have more energy for dashing about and burning the candle at both ends. A common misconception is that it takes a lot of planning and time in the kitchen to eat a healthy diet. Students often need quick fixes between lectures or before going out in the evening and the last thing on the agenda is planning a well-balanced meal. In reality, you can eat quickly and healthily and you don't need to resort to a bag of chips on the way to the pub in order to line your stomach before a big night out. There are plenty of options for healthy snacks that will tide you over or keep you going during the day and you don't need to spend all your free time hanging out at the health food shop to take advantage of them. A simple sandwich can be transformed into a vitamin-packed boost, depending on your choice of bread and filling. Here are some ideas for quick snacks that will fill you up and give your body a health boost (or more of a health boost than a packet of crisps!). Bananas are packed full of magnesium and other nutritional goodies. Always choose granary bread for its whole grains and slow-release carbohydrates. Spread with honey for an immunity boost and slice the banana onto the bread. Quick, delicious and oh so good for you! These are filling and contain a wonderfully healthy cocktail of vitamins. Slice around the stone with a sharp knife and twist the halves apart. Carefully tap the knife through the centre of the stone, wiggle it around a bit then lift out and the stone should come too. Pour a little salad dressing into the dents and enjoy. A bit of a treat but it's better than reaching for the chocolate. For the best flapjacks, try making your own - a batch will last a week or so if kept in an airtight container. Oats are another slow-release carb that will help keep your energy levels at a constant and you'll feel like you're having a bit of a treat as well. These are really quick to cook in the microwave and make a pretty well balanced meal if served with some baked beans and a side salad. Cook it while you're getting changed to go out and you'll have a decent meal that should stop that craving for the kebab shop later on. The ultimate snack for when you're scurrying between lectures. 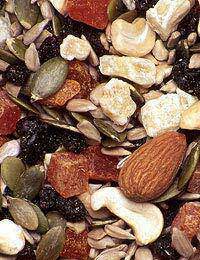 Buy a selection of different nuts and dried fruit and take a handful in a small bag or container in your bag each day. This is a posh name for raw vegetables that are cut into chunks or batons. You'll usually see them at a buffet party but they make an ideal healthy snack. Carrots, peppers, celery, cucumber and cauliflower are all good options. Put a handful in a freezer bag and pack a small tub of hummus or salsa for dipping. Keep the fridge and cupboards stocked with plenty of fresh fruit and veg, choose granary or wholemeal bread and try and avoid reaching for the biscuit tin every time you fancy a quick bite. This should see you well on your way to getting into a healthy snacking habit.